First poach the whole bird for 10 minutes. Then roast at 450 degrees, melting the skin and rendering it oh so crispy. Hearing Michael Ruhlman speak in defense of roasting one’s own whole chicken (a process that surprisingly still intimidates a number of time-crunched Americans) at a foodie conference in Portland late last month made me curious to try his (ala Thomas Keller) supposedly fail-safe method for a crispy yet tender bird. But then Dan came across this hybrid process for “the perfect roast chicken” as a recommended link on the Marginal Revolution blog, beloved by epicurean economists everywhere. So per Felicity Cloake’s advice, I found myself poaching the whole bird for 10 minutes and then firing it at Ruhlman and Keller’s recommended 450 degrees. The poaching method appealed, since I was seeking extra moist breast meat for chicken salad. My mother’s beloved tarragon chicken salad recipe, of course, says to just poach the breasts and cut up that meat. But whole free-range chickens from Draper Valley were on sale, and I’d rather have a carcass to boil down into stock anyway. 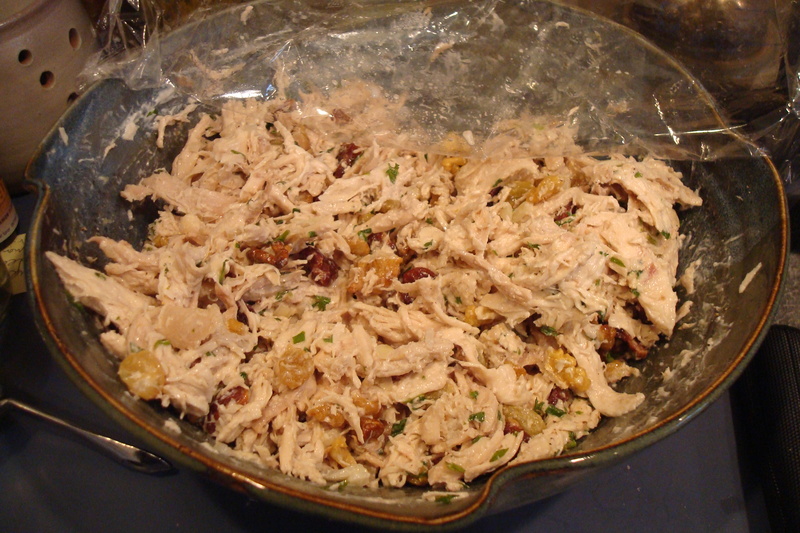 A "keeper" chicken salad: poached meat tossed with greek yogurt and mayonnaise, a little champagne vinegar, salt and pepper, rehydrated dried cherries and golden raisins, a minced shallot, two tablespoons chopped fresh tarragon, chopped toasted walnuts this time instead of slivered almonds. Yum! The secret to these roast chicken recipes? 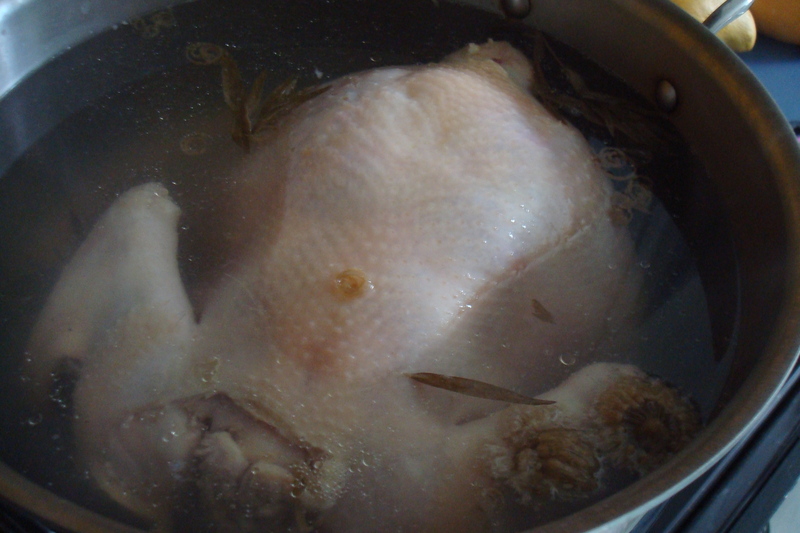 Pat the bird dry before roasting, so the skin crisps and doesn’t steam. Ruhlman and Keller forgo basting and/or covering the bird with pats of butter for that reason. I did splash some olive oil on the skin with salt but now I fear that wasn’t necessary. I also could have done a better job trussing, per Keller’s suggestions. Roasting at 450 was 25 degrees higher than I usually go, and boy did the oven smoke as the dripping grease splattered. Do I need to self-clean my oven after this process? 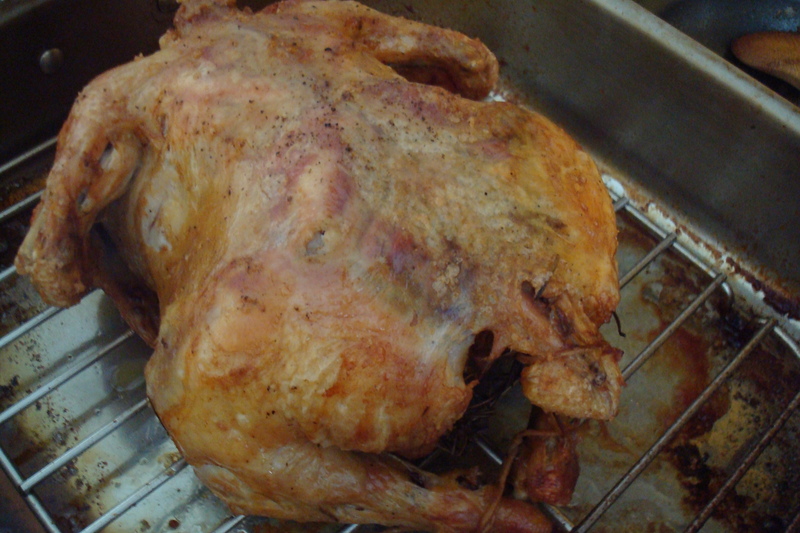 It’s hard to believe Judy Rodgers’ famous recipe from the Zuni Cafe calls for roasting at 480 degrees. My meat was tender, considering I bought a whopping 5.5 pound chicken, nearly double the size the pros recommend for the tenderest meat. But hey, it’s sustainable to bring them up in weight for not much more feed. And boy was that chicken crisp, yet not 100 percent in a spots, perhaps because of the pre-poaching. But writing this makes me realize the Zuni Cafe recipe may be the way to go, with its dry salt rub in advance, now my favorite way to brine a Thanksgiving turkey. It’s about time I stopped ignoring everyone’s advice. Hey, Michael Ruhlman roasts a chicken every week. It takes practice to refine your technique. Speaking of technique, for some reason I left covered the carcass I was boiling into stock. Duh. I guess I’ll have to now cook it down so it’s more flavorful for soup. At least I didn’t leave the cooling stock out on the stove overnight, a mistake I’ve made more than once. Stay tuned to see what kind of soup I’ll cook up this week.